Galerie Louise Leiris, Paris (acquired directly from the artist). Anon. sale, Christie's, London, 30 March 1987, lot 32. Waddington Galleries, London (acquired at the above sale). 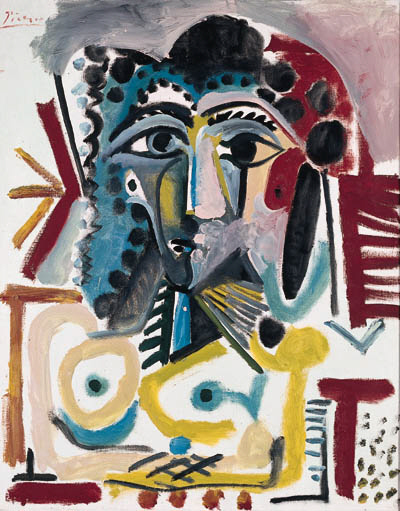 C. Zervos, Pablo Picasso, Paris, 1972, vol. 25 (Oeuvres de 1965 1967), no. 157 (illustrated, pl. 86). Baden-Baden, Staatliche Kunsthalle, Pablo Picasso, Das Sptwerk, Malerei und Zeichnungen seit 1944, July-October 1968, no. 80 (illustrated). Stockholm, Moderna-Museet, Pablo Picasso, October 1988-January 1989, no. 93.